Goldilocks and the Three Bears and Me. 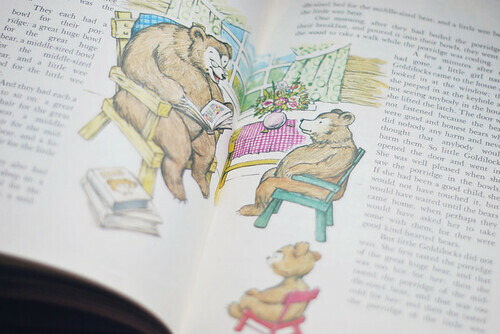 Once upon a time, there was a family of three bears. They lived in a happy little home together, and each day they would go for a morning walk while waiting for their breakfast to be just right for eating. 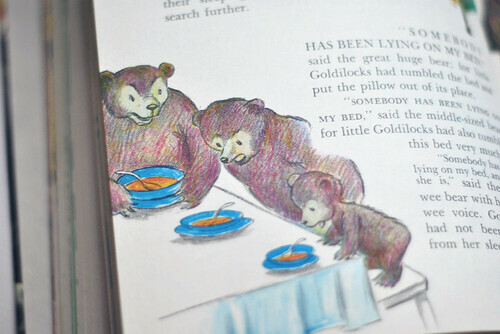 On one particular morning, a little girl named Goldilocks (named for her lovely blond curls) discovered the home of the three bears. She knocked on the door, but no one answered. 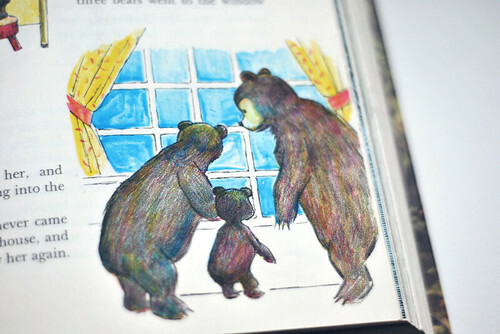 Instead, the door opened easily, because the bear family had left it unlocked. Goldilocks went inside, looking around for who might be there, but found no one. She did, however, find some breakfast porridge all laid out, as though it was just for her. The largest bowl was too hot, the medium bowl was too lumpy, but the smallest bowl tasted just right. And so she ate it all. Being curious, and a little worn out from her adventure so far, Goldilocks looked around for a place to sit for a while. She soon discovered several chairs to choose from. The first was too large, the second was too squishy, but the smallest chair was just right. 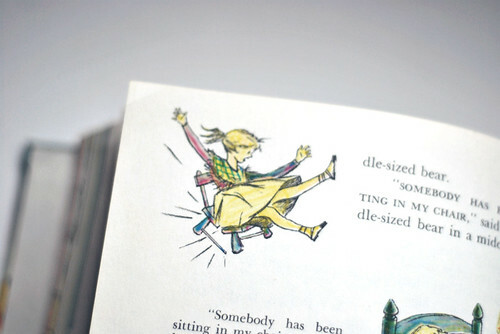 And so she sat. Unfortunately, what felt right, wasn't, and the chair broke into several pieces. Now she was more tired than ever, and looked for a place to rest. 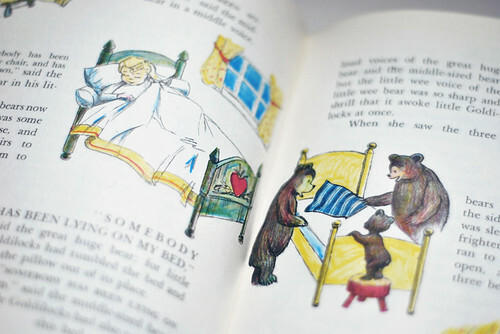 Upstairs, were three very comfortable-looking beds, and Goldilocks was certain that a nap would make her feel better. The first was too hard, the second was too soft, but the third bed was just right. And so she slept. In the meantime, the bear family returned to their breakfast. 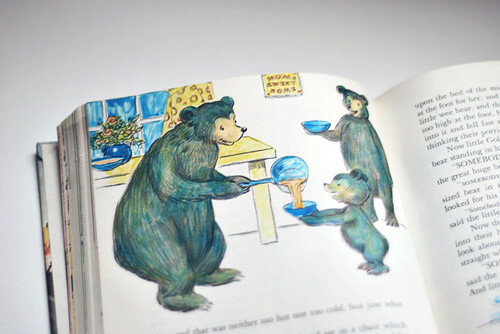 The papa bear noticed that his porridge had been tasted, as did the mama bear. Of course, the baby bear had no porridge to discover at all! They then found their chairs moved and sat in, and the baby's chair was broken in pieces! At last, they went upstairs. The blankets were ruffled bunched up, and baby bear's blankets had a very strange lump in them! The bears weren't too sure what they should do, but they didn't have to do anything. Goldilocks suddenly woke up from her nap and was so startled by the bear's presence that she started to run from the house. But the bears stopped her, and told her that she should visit again. But next time, perhaps it could be when they were home to welcome her themselves. 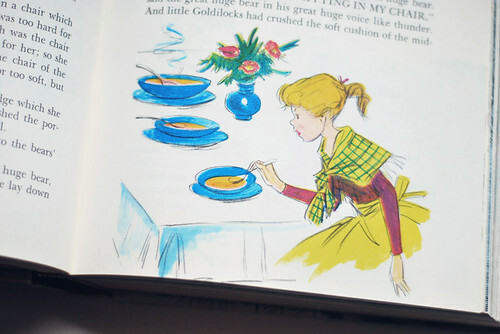 What was it about this home that made Goldilocks feel so comfortable that she would walk in and make herself at home? And what can we do to create that same atmosphere? mollie, thanks for sharing your take on this story. i'd love to have a home where anyone would feel comfortable coming in, that is an inspiring thought. Oh! What a wonderful thought- I would love to have a home that everyone feels welcome in and always wants to visit. It is so wonderful when we have a house full of people, but I am also a huge introvert and am not good about inviting people over. Thanks for this reminder to get some adjustments going! I'm terrible at keeping my house up enough for surprise visitors. Something I'm trying to work on this year. I just need to schedule better.